One of the hottest games on YouTube over the last couple of months isn’t some big-budget action game. It’s Baldi’s Basics in Education & Entertainment, an intentionally horrifying pseudo-educational game we covered back in April. It’s turned out to be the perfect game for YouTube. The game came out a few months ago and got some initial attention because it is just so wonderfully weird. It exploded in May when popular gaming YouTubers like Markiplier and Pewdiepie recorded Let’s Plays. In June, a stream of fan-created content that has incorporated elements of Baldi’s Basics started to flow onto the video-sharing platform. These videos, which are mostly animation videos, have brought in millions of views. Interest in this game is still high, given that just a few days ago, YouTube channel Random Encounters produced a musical about Baldi’s Basics, “BALDI’S BASICS: THE MUSICAL (Live Action Original Song)” which gained 4.8 million views and landed #12 on YouTube Trending. Baldi’s Basics is a free-to-play game in which you play a student who must gather seven notebooks scattered around a school while being chased by Baldi, a freakish teacher who slaps a ruler onto his hand as he gets closer to you. While the beginning of the game incorporates easy math problems for you to solve in these notebooks, the questions eventually become unanswerable, and the “learning” aspect of the game disappears. Baldi’s Basics is actually a horror game that hides under the guise of edutainment. In April, we called it “self-consciously terrible.” It features iconic yet hideous 90’s-inspired graphics, ear-grating sound effects, and jump scares, making it ideal for YouTube, where similar games like Slenderman and Five Nights at Freddy’s have flourished. The videos by Markiplier and Pewdiepie videos have respectively raked up 5.3 million views and 4.1 million views and helped fuel the game’s ongoing YouTube success. In their clips, the YouTubers are frustrated and shocked. The comments section of their Let’s Plays are littered with comments such as “J U M P R O P E ? !﻿” and “Gotta SWEEP, SWEEP, SWEEP!! !﻿” These are lines from characters in the game who were infuriating obstacles for players trying to escape the school. Fans of Baldi’s Basics have created new videos dedicated to the game that have gained even more views on YouTube than the Let’s Plays by Markiplier and Pewdiepie. Before she uploaded “Basically Baldi’s Basics- animation”, YouTuber YoruShika was only bringing in around 50-150,000 views per YouTube video. That Baldi’s video got 8.8 million views. Since that video, YoruShika has continued to create and upload short animations that feature characters from the game, such as “SWEEPING TIME- Baldi’s Basics animation” and “Detention for you- Baldi’s Basics animation”, which have respectively gained 5.1 million views and 3.6 million views. Her animation shorts are not popular just because she included characters from Baldi’s Basics. 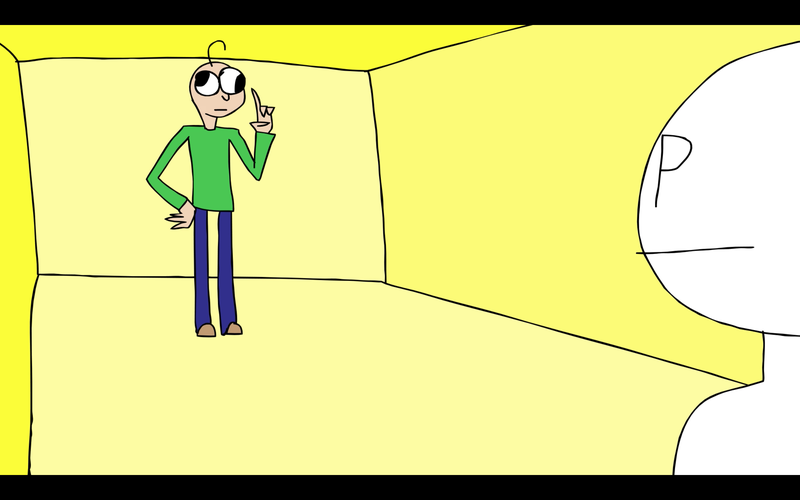 In her most widely-viewed Baldi’s Basics animation video, Baldi, voiced by YoruShika, refers to the “beautiful and fantastic graphics” the game has to offer, reverting to an aesthetically unsightly version of himself for a split second. The straight face and silence Baldi receives from the player character in the animation perfectly captures the self-awareness behind the game that the fans adore. Crossovers between the world of Baldi’s Basics and other beloved games have also been spreading on YouTube. Level UP, a YouTube channel that produces 8-bit animation videos, has created three shorts in which Baldi infiltrates the worlds of Sonic the Hedgehog, Donkey Kong, and Super Mario. In their most-viewed video, “Baldi would be OP in Super Mario Bros.” Mario’s squad (consisting of him, Luigi, Toad, and Yoshi) drops in numbers as they attempt to clear the level by collecting notebooks, completing math questions, and escaping Baldi’s wrath. This video gained 4.7 million views in under a month. The crossovers, however, have not been restricted to video games. In Surreal Entertainment’s bizarre but entertaining “How to complete Baldi’s Basics,” rapper, record producer, and fashion designer Kanye West descends from the ceiling and saves the player from Baldi. Kanye’s heroic deed has been viewed more than 2.2 million times. Let’s face it. Baldi’s Basics is ugly. Like, really ugly. And everyone knows it. However, its purposely poor graphics have failed to stop people from enjoying the game. Fans enjoy it so much that they have found ways to recreate Baldi’s Basics with in other popular games, such as Roblox and Minecraft. And everyone knows that your game has truly made it if it’s been recreated in Minecraft.